Indian High School Dubai have steamrolled opponents en route to the Under-14 finals, where they’ll encounter the International School of Choueifat from Abu Dhabi. IHS are one of only two teams in the age group, as well as the entire tournament, to finish the round robin stage with all five wins. 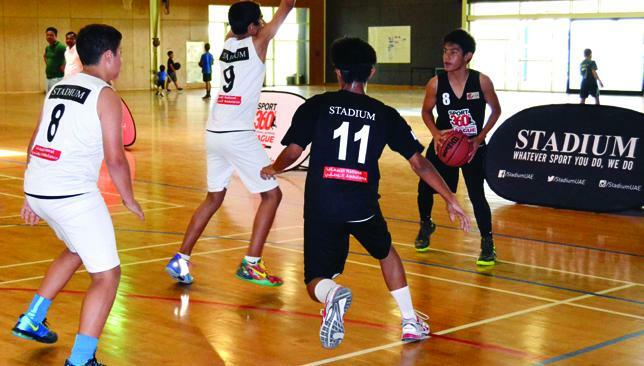 The other was New Filipino Private School, who Indian Hoopstar beat 42-38 in the quarter-finals. It would be easy to think that IHS haven’t truly been tested yet, but in addition to the close win against NFPS, they were arguably in the toughest group, which had four out of six schools finishing with a winning record. “We’ve faced a lot of challenges,” IHS guard Lavesh said. Lavesh has stood out in a team full of strong players, his 71 points ranking third in the age group. He’s also in top form after shining in the semi-finals with 27 points to single-handedly outscore Delhi Private School Sharjah in the 50-25 win. ISC have their own reliable ball-handler in Khalifa Khouri, who scored 15 points and earned player of the game honours in the semi-finals, along with a big man tandem of Kareem Eid and Gohar Hussain in the frontcourt. accomplished much in reaching this stage, no matter the result against IHS. Intra-Emirate rivalry: VISS (white) and NFPS..
A rematch from group play will decide the NSL Under-16 champions as Victoria International School Sharjah look for a different outcome this time against New Filipino Private School. Boasting size and height, especially in the form of dominant centre Hashim Hazeem, VISS appear the favourites on paper against the smaller roster of NFPS. However, there’s more to the Patriots than meets the eye and they’ve already taken down the giants once with a 32-23 win during group play to hand VISS one of their two losses so far. The strength of NFPS lies in their ball-swarming defence. In their semi-final match-up against Dubai International Academy, the Patriots shut down the Wolves’ attack and forced countless turnovers with a full-court trap. VISS won’t be as vulnerable with their cast of ball-handlers, including dynamic point guard Enver Kapetanovik, but NFPS are planning to apply pressure all the same. “If our opponent is not good at ball-handling and not good in passing, we will beat them,” NFPS coach Aris Peralta said. VISS do have a centre in Hazeem who will pose a daunting challenge for NFPS. The big man has been a force in the paint throughout the tournament, notching 79 points, a league-high 62 rebounds and 13 blocks. NFPS though are a long way past fearing their lack of height, with Eric Pancito – the player of the game in the semi-finals with 17 points – admitting his team initially “lost our hope to win” because of the disadvantage, before gaining full confidence. Regardless of the outcome, Sharjah will reign supreme over Dubai and Abu Dhabi in the age category, which McKie feels isn’t a surprise. “Look at it, it’s two Sharjah teams in the final,” he said. “That’s an even bigger accolade and shows you how tough the Sharjah leagues are. “The Dubai schools often get the bigger press, the bigger accolades for where they are. Sport360 brings you all the action from the Under-16 National School League Basketball semi-finals held at Victoria International School Sharjah. The NSL FInals take place on Saturday 6th June – click here for more information.